Whether you are moving around the corner or across the globe, with a precious heirloom or a complete house, David Duggleby Movers and Storers have a service for you. With a specialized road fleet, professional staff, and premium storage facilities our reputation for exceptional service and efficiency is guaranteed. The county of North Yorkshire is a wonderful place to live and work, with beautiful villages in and around the Yorkshire Dales and the North York Moors. From our base in the coastal town of Scarborough, North Yorkshire, David Duggleby Movers and Storers are ideally suited to help with any removal needs across North Yorkshire. 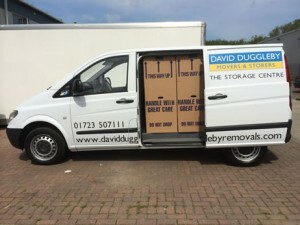 David Duggleby Removal and Storage company have 30 years of experience as a removal firm in North Yorkshire helping people and businesses move their furniture, their belongings and their valuables, and we also have extensive knowledge of the best packing boxes and packaging required for your removal and storage in North Yorkshire. Our storage warehouse is located in Scarborough, North Yorkshire and with our fleet of removal vehicles in North Yorkshire we can also pick up and drop off all of your storage containers to and from anywhere across North Yorkshire, or even further away if this is required. We work with many auctioneers and many antiques dealers regularly, so we also know how to transport your delicate and valuable items, whether it’s fine art removals in North Yorkshire or concert pianos removal or storage in North Yorkshire, we can offer you the removal service you reqire from a North Yorkshire removal company. Our team of removals experts will also provide a full or partial packing and unpacking service, with our extensive training and experience you can rest easy in the kowledge that all your personal belongings will arrive at your new home undamaged. Across North Yorkshire we’ve helped people move from house to house, town to town, even removals from the UK to abroad. So wherever you need removals in North Yorkshire or Storage in North Yorkshire, David Duggleby the removal and storage company are ready and prepared to help you in North Yorkshire. Storage is a great solution if you have to be out of your old house in North Yorkshire before your new one is ready, or you could also use our storage services if you are leaving North Yorkshire and moving abroad and can’t take everything with you. storage with David Duggleby storage company is also fully insured and provided by corteous and helpful staff. David Duggleby Movers and storers will accommodate anything you need to store in North Yorkshire. There are numerous reasons why people opt to use our Storage services in North Yorkshire, whatever the reason we are able to help. Using our own removal vehicles we will bring the Storage containers to you. Once finished the container is then sealed up and stored at our modern storage centre in North Yorkshire. David Duggleby Removal and Storage company can help you in selling your home in North Yorkshire! By removing items from your home you can market your property much more effectively. We can also then supply you with any packing materials you may need before we store your items, which can be short term storage or it could be many years until you’re ready to remove your items from storage. We can arrange to come anywhere in North Yorkshire and collect your items and place them into our fully secure modern storage facilities in North Yorkshire until you’re ready to have your possesions re-delivered at your new property anywhere in North Yorkshire. DIY storage is another services we offer. This could be for anything such as de-cluttering, storing seasonal items, between homes in North Yorkshire, or even following a disaster until your home fully repaired for your return. The only difference is you bring the items in to us yourself! This will give you the ability to select a time that best suits your needs, and potentially saving on the costs of collection. Many people choose to bring things in using their car, if you’re storing winter clothing for example. North Yorkshire Students sometimes are concerned with what a student should do with their items while they are at college or university. If you are a student why not store them using David Dugglebys storage services in North Yorkshire. David Duggleby removal and storage firm can collect any of your things from you, we will store them securely in North Yorkshire, and then we re-deliver your items back to you anywhere in North Yorkshire. When moving house with David Duggleby it is always a very straight forward process, right from the start when you first contact us up until the last item is put in its final position anywhere you want in your new home. Contact us to talk about your removal and if it is viable we will arrange a home visit in North Yorkshire with one of our removal and storage company team members, to assess your items for removal and give you an exact price for removal service that you will require. Once you have a provisional date setup for your removal in North Yorkshire you will be looking into packing up your items in your home. We can offer you a packing service for anything whether its just for the fragile items or a full pack of everything in your house we can help you along the way. why not enquire about short term storage in North Yorkshire for storing your items in between you moving from one house to another. During your removal day(s) we will work with you all the way ensuring your move runs as smoothly as possible. 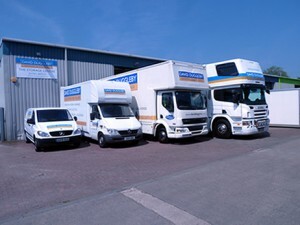 David Duggleby Removal and Storage company also offer international removal services. We will pack, ship, and deliver your items anywhere in the world. Whether they are travelling internationally via road, via sea, or via air you can rest assured that everything is completly documented, fully packed, and tracked in real time evry step of the way to the destination. Having over 30 years’ worth of experience within the antique and fine art removal trade moving items in conjunction with various auction rooms throughout North Yorkshire, David Duggleby removal services have great expertise in moving antiques, fine art, and valuable items. We also make bespoke packing crates. They are constructed in our personal workshops where they are made to fit the needs of any specialist items. These can include chandeliers, paintings and vases to name just a few examples. David Duggleby removal company can also manage your office and business removal with minimum disruption. The planning of a office move is the most important part and is crucial for a smooth office and business move. We will effectively planthe whole day of the move and can we also offer our packing services so your business can continue working. There are sometimes occasions when your business needs to store items, this could be for both long and short term. David Duggleby Movers and Storers can cater for your commercial storage needs at our CCTV covered, modern and fully insured storage warehouse in Scarborough. David Duggleby removals company are also specialist in piano removals. Our teams members can often be seen removing pianos from residential homes, local authority venues and events. We can also offer a piano disposal service. We will remove the old piano when we deliver the new one. Are you moving home in North Yorkshire? Do you need removals in North Yorkshire or storage in North Yorkshire? We are a North Yorkshire removal company and storage firm and we cover all of North Yorkshire includingMiddlesborough removals and storage, Guisborough removals and storage, Harrogate removals and storage,Northallerton removals and storage, Redcar removals and storage, Saltburn removals and storage, Selby removals and storage, Tadcaster removals and storage, Thirsk removals and storage and York removals and storage. We can offer you the complete removal service anywhere within North Yorkshire including our packing services and of course removals in North Yorkshire and storage in North Yorkshire. So if you’re ready to move in North Yorkshire, or just have a few questions about our removal services in North Yorkshire, get in touch on 01723 507111. You could even get in touch via our facebook page. Or you can also get in contact with us by email, or try our online removals quote form. Let our removals company David Duggleby Removals and Storers make your move as easy as possible. We are a North Yorkshire removals firm who offer removals services in North Yorkshire. If you are looking for North Yorkshire removals or storage in North Yorkshire then you have come to the right place.